This ICEC Essential News Letter provides updates from activities related to global cancer care over the last six months. From our office in downtown Washington, DC, alongside the Consortium of Universities for Global Health (CUGH), we are pursuing opportunities to work with other NGO’s interested in global health. As we noted previously, with uncertain US Government budgets investment in global health and country-to-country activities will require increased efforts from non-government organizations and industry. The continued rise in interest in cancer care as a key component of global health is encouraging. ICEC continues to broaden its outreach and is a member of the Global Health Council, the Global Health Security Roundtable and the NCD Roundtable. Staff and Board have recently attended the Toronto Global Cancer Control Conference, the CUGH annual meeting on Health Disparities: a time for action and the 6th Annual Symposium on Global Cancer Research, hosted by the NCI. ICEC is working in two closely related pathways, mentoring and innovation in the application of technology. 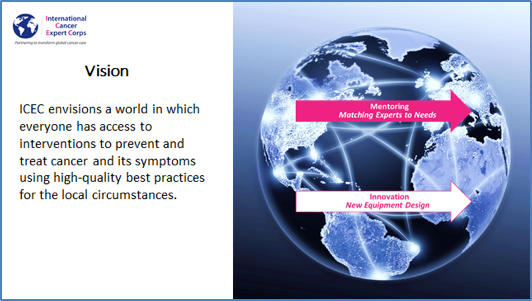 As illustrated in slides (below) taken from an ICEC presentation at the ICARO2 meeting in Vienna in June 2017, Figure 1, the first pathway, is the sustainable mentoring network and the second is the implementation of technology to enhance mentoring and education. Despite our limited budget, good progress has been made on both “arrows” as will be detailed. It is recognized that for ICEC to achieve its goals, metrics of progress and success are essential. This is an issue by no means limited to ICEC as it is a challenge to assess progress and recognize accomplishment in global health. It is due, in part, because the usual measures of success in academia are currently difficult to achieve including publication in what are called “high impact” journals and attaining sustainable grant support, particularly from prestigious funding sources such as the National Institutes of Health. Given the highly competitive nature and low success rate (~10%) for grant funding, it is a challenge to sustain a funding stream with most scientists spending a significant amount of time in the funding process. What is now needed is a bona fide career path for global health. A recent publication that is helping to lead this effort was co-authored by many of ICEC’s Ellen Lewis Stovall Early Career Leaders is “Global Health in Radiation Oncology: The Emergence of a New Career Pathway, Semin Radiat Oncol. 2017 Apr;27(2):118. Co-authors are Danielle Rodin, Mei Ling Yap, Surbhi Grover, John M. Longo, Onyinye Balogun, Sandra Turner, Jesper G. Eriksen, C. Norman Coleman and Meredith Giuliani. The paper notes: We explore how defining specific competencies in this area can help trainees and practitioners integrate their activities in global health within their existing roles as clinicians, educators, or scientists. This would also help create a new global health track for academic advancement, which could focus on such domains as implementation science, health service, and advocacy. We discuss how effective mentorship models, international partnerships, and institutional twinning arrangements support this work and explore how new resources and funding models might be used to further develop and expand radiation oncology services globally. The ICEC “5-Step Progression Plan© (Figure 2) is designed to establish metrics and provide measurable goals for the ICEC Centers, Associates, Hubs and Experts. As determined at the last Board of Directors meeting, the Career Path Working Group is being activated and will seek to understand the career paths that now exist in academia and build from there. The roster of ICEC partnerships continues to grow from existing twinning programs. 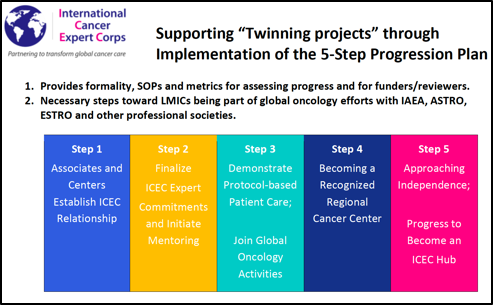 ICEC assesses where they fit into the “5-Step Progression Plan” in order to phase in the education, training and mentorship metrics to track the progression of the ability of programs to deliver high-quality care with the long-term goal of each program’s becoming a recognized regional cancer center. ICEC continues to support the piloting and use of the National Comprehensive Cancer Network (NCCN) Framework for Resource Stratification of NCCN Guidelines (NCCN Framework™) and the NCCN Harmonized Guidelines™ for Sub-Saharan Africa. NCCN’s goal “is to identify appropriate treatment at four resource levels—Basic, Limited, Enhanced, and Maximal—and deliver a tool for health care providers to identify treatment options that will provide the best possible outcomes at a given resource level”. The NCCN Harmonized Guidelines™ for Sub-Saharan Africa represent both the optimal care that these countries aspire to provide and pragmatic approaches that provide effective treatment options for resource-constrained settings. Both resources are particularly valuable tools to be used in LMICs and other challenging environments. ICEC appreciates the unique opportunity to work toward formal guideline and protocol development with an expert group and one connected closely with the major academic cancer centers. The need for robust, first-rate radiation treatment systems capable of functioning in the challenging environments encountered in many developing countries is another well-recognized global need. ICEC’s program that addresses this challenge is the lower arrow in figure 1. This topic was the subject of an ICEC-sponsored, CERN-hosted workshop held at CERN in November 2016 and in October 2017. Overviews of the workshops are available on our website and in the CERN Courier (http://cerncourier.com/cws/article/cern/67710). Publication of a detailed report of the 2016 workshop is under review and a report of the 2017 workshop is in preparation. The follow-up workshop at CERN in October 2017 was entitled “Innovative, robust and affordable medical linear accelerators for challenging environments”. The event was a collaboration between CERN, ICEC and the UK Science and Technology Facilities Council (STFC) and was organized by Manjit Dosanjh and Paul Collier, Norman Coleman and David Pistenmaa, and Charlotte Jamieson, respectively. About 50 participants including physicians and physicists from five UK Official Development Assistance (ODA) countries (Botswana, Ghana, Jordan, Nigeria and Tanzania) met to further define the equipment needs in LMICs and to build a strategy for increasing access to radiotherapy for a larger number of people by developing novel, innovative, robust and affordable medical linear accelerators for the treatment of patients with cancer in challenging environments. STFC established an immediate objective to develop 5 work packages involving ODA countries that corresponded to the technical sessions of the workshop. A. Linear accelerator simulations for the stable and sustainable operation of developing country radiotherapy linear accelerators (PIs: Stewart Boogert and Marco Carlone). Accelerator technology options study (PIs: Peter McIntosh and Alan Wheelhouse). Cloud-based Electronic Infrastructure in Support of Linac-based Radiotherapy in Challenging Environments (PIs: Ajay Aggarwal and Jatinder Palta). Robust Permanent Magnet Beam Delivery Systems for Medical Radiotherapy Linacs (PIs: Suzanne Sheehy and Ivan Konoplev). RF Power Systems and Optimized RF Structures for Electron Beam Acceleration (PIs: Ivan Konoplev and Suzanne Sheehy). The Kaplans and their extended family have made and continue to make substantial contributions and commitment to improving the health and well-being of others and of society as a whole. While Dr. Henry S. Kaplan’s pioneering work in the cure of Hodgkin’s disease and in cancer biology at Stanford and as the co-developer of the medical linear accelerator and standards for its use for cancer treatment are well known, both he and his wife, Leah Kaplan, as the Dean of Women and Ombudsperson at Stanford and a social worker, counselor and psychotherapist, served as extraordinarily effective mentors and role models for service to humanity and human rights. ICEC has established two tracks to acknowledge individuals who exemplify the spirit of Henry and Leah Kaplan in their work. The Henry S. and Leah Kaplan Human Rights and Service to Humanity Fund will provide peer-reviewed support for mentorship and leadership activities for the ICEC. This will include individual peer-reviewed grants to partially support mentorship and group peer-reviewed grants for specific ICEC-affiliated projects that emphasize the human rights aspect of global health. An occasional separate and distinct award, the Henry S. and Leah Kaplan Human Rights and Service to Humanity Award, will serve as an instrument of good to highlight the efforts of select extraordinary individuals whose work has had a truly significant impact on global health. ICEC continues to garner support for two other funds also exclusive to ICEC including the Ellen Lewis Stovall Early Career Leaders Fund and the Rodney R. Million, MD Fund for Innovation in Clinical Care. These funds, awarded through grant applications, provide ICEC with the resources to directly support practitioners in their efforts to improve global cancer care in challenging environments. These funds are designed to provide financial support to early career healthcare practitioners focused on global cancer care, a group that often faces funding challenges while pursuing academic medical careers. We currently have eleven Early Career Leaders of whom seven are actively running twinning programs or fostering mentoring relationships in twelve countries. The Dr. Rodney R. Million Fund for Innovation in Clinical Care was established by a generous contribution from the Million family to support cancer educational activities in Africa. Currently, the fund supports Chika R. Nwachukwu, MD, Medical Resident PGY-4, Department of Radiation Oncology of Stanford University. Dr. Nwachukwu, an ICEC Expert, has projects in Kenya, Nigeria and Tanzania. As a primary focus, Dr. Nwachukwu, with Dr. Lynn Million, is working to establish an ICEC Twinning Program between the Kenyatta National Hospital in Nairobi, Kenya as a recognized ICEC Center, and the Department of Radiation Oncology at Stanford Medical School as an ICEC Hub. We look forward to watching the progress in the upcoming months. ICEC continues its efforts to raise funds to support its many activities. ICEC encourages all types of vehicles to facilitate support of our mission including individual donations, corporate and foundation support and planned-giving opportunities. ICEC’s support of its Early Career Leaders has garnered the interest of foundations and corporate support. To make a donation to support the Kaplan, Stovall, and Million Funds, or to make a contribution for the general support of ICEC, please visit the ICEC website’s donation page. David A. Pistenmaa, MD, Ph.D. was honored with an annual David A. Pistenmaa, M.D., Ph.D., Distinguished Lecture in Radiation Oncology by the University of Texas, Southwestern Department of Radiation Oncology. The initial lecture was presented on February 13, 2018. – September 2017: The 9th Global Ethiopian Diaspora Conference on Health Care and Medical Education: “Cancer and cancer care in Ethiopia.” ICEC Presentation on ICEC’s mentoring partnerships, Twinning Programs and Innovation. – October 2017: ICEC-CERN-STFC meeting in November had a number of presentations and discussions led by ICEC members. – March 2018: National Cancer Institute Center for Global Health at NIH. Global Cancer Research: Addressing Disparities, Locally and Globally. ICEC Poster Presentation, “Responding to a Critical Need: ICEC 5-Step Progression Plan© for Associates, Experts, Centers and Hubs. National disparities in treatment package time for resected locally advanced head and neck cancer and impact on overall survival. Guttmann DM, Kobie J, Grover S, Lin A, Lukens JN, Mitra N, Rhodes KV, Feng W, Swisher-McClure S. Head Neck. 2018 Feb 2. Assessing HPV and Cervical Knowledge, Preference and HPV Status Among Urban American Indian Women. Cina KR, Omidpanah AA, Petereit DG. S D Med. 2017 Oct;70(10):439-443. Radiotherapy in small countries. Barton MB, Zubizarreta EH, Polo Rubio JA. Cancer Epidemiol. 2017 Oct;50(Pt B):257-259. The ICEC Central Operations Working Group (COWG) convenes weekly. Notably, members of our “volunteer” staff are providing extensive expertise: Costing out the hours of volunteerism, we had nearly 2000 (1997 to be exact) donated hours for 2017. Using the NIH FTE rate (not the actual salaries which would be greater), this amounts to more than $230,000. We have established an award system for donated time on an annual basis with the following categories: Bronze- 50 hours, Silver- 100, Gold- 200, Platinum-300, and Diamond- 400 (or equivalent to >8 hours per week or “20% FTE”). In addition, ICEC hires interns to assist with COWG communications, outreach and our technology innovation research efforts. With efforts from the Center for Biomedical Informatics and Information Technology (CBIIT) at NCI, the Open Systems Health Laboratory (OHSL) and Ceferino Obcemea, a medical physicist who recently joined the NCI Radiation Research Program (RRP), there has been substantial progress in the implementation of TELESYNERGYTM. We established our teleconference facility which is used for RRP teleconferences with grantees, international scientific collaborators and global partners. As with all teleconference systems, we experience challenges working with facilities and individuals with low bandwidth. Nonetheless, thanks to the expertise of NCI and their commitment, the conferencing system is comparable to other systems currently available. This is very welcome progress as it enhances NCI’s outreach. The Board of Directors was expanded in 2017 to include a broader range of expertise and international membership, namely: Manjit Dosanjh, PhD, Life Sciences Advisor, European Organization for Nuclear Research (CERN), Miles Pomper, Senior Fellow, James Martin Center for Nonproliferation Studies, and Rebecca K. S. Wong, MSc, MD, FRCPC, Cancer Clinical Research Unit (CCRU), Princess Margaret Cancer Centre, University of Toronto. We continue to seek the participation of our international colleagues and encourage you to contact ICEC if you are interested in joining us in our efforts. A list of Board members and their biographies are available on the ICEC website. ICEC’s Advisory Board is comprised of a highly motivated group of individuals interested in advancing the efforts of the organization to improve access to high-quality cancer care globally. Advisory Board members guide and support the governance work of the board as well as some of the management assignments carried out by staff. Their individual expertise is valuable to the organization as they serve as both ambassadors and emissaries to our constituents and serve as scientific, programmatic, and development advisors performing important duties, such as program evaluation, fundraising and advocacy. Jacob van Dyke and Yakov Pipman, members of Medical Physics for World Benefit, have contributed significantly to ICEC’s efforts to develop innovative ideas to improve radiation treatment systems capable of functioning in challenging environments. David Jaffray has also been instrumental in the development of this program. Other Advisory Board members making key contributions to further the mission of ICEC include Surbhi Grover regarding her on the ground experiences developing a cancer center in Botswana, Michael Friedman and Majid M. Mohiuddin, MD each contributing to our development efforts, and Keith Martin, PC, MD, (CUGH) and Danielle Rodin, both of whom have raised the visibility of ICEC in the global health landscape.